U.S. Diplomatic Mission To Palestinians To Merge With Embassy In Jerusalem The U.S. Consulate General in Jerusalem long served as a key diplomatic line to the Palestinian Authority. Now the U.S. is downgrading the mission and merging it with the Embassy to Israel. This old building had until now served as the U.S. Consulate General in Jerusalem, which oversaw a key diplomatic line to Palestinian officials. The Consulate General in Jerusalem is the U.S. government's de facto representative office to the Palestinian Authority. 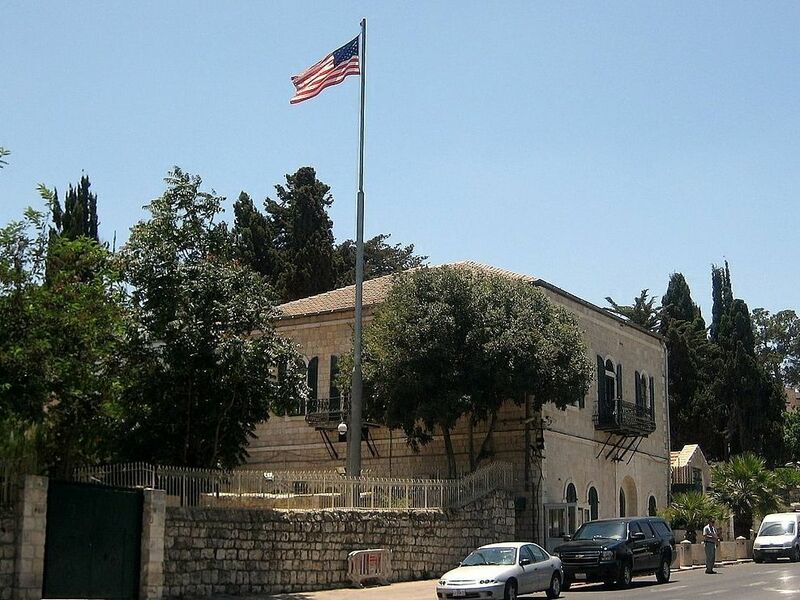 The diplomatic mission, first established in 1844 and housed in a historical stone estate in downtown Jerusalem, will be downgraded to a Palestinian Affairs Unit and will merge with the new U.S. Embassy to Israel. Consul General Karen Sasahara, who has served as an unofficial ambassador to the Palestinians, is leaving Jerusalem and won't be replaced. A lower-ranking foreign service officer will head the new unit. U.S Ambassador to Israel David Friedman, a longtime supporter of Israel's West Bank settler movement whom Palestinians see as their ideological opponent, will oversee diplomatic relations with the Palestinians and Israelis both. Secretary of State Mike Pompeo said the move, which he announced in October, will "improve the efficiency and effectiveness of our operations." Palestinian officials view it as a hostile move. "The U.S. administration had a choice to build constructive relations with the Palestinian people and leadership. Instead, it chose bullying and arrogance," Palestinian Foreign Minister Riad Maliki said in a statement. "Historically the position of Washington has been, the two should not be merged," said Ed Abington, a former U.S. consul general in Jerusalem. "Now they're merged. The effect on our ability to deal with the Palestinians is being greatly damaged." Last year, the U.S. moved its embassy from Tel Aviv to Jerusalem, endorsing Israel's claims to the city but enraging Palestinians who also have claims there and drawing international criticism. Palestinian authorities cut off ties with U.S. officials in protest. Then the U.S. closed the Palestinians' diplomatic office in Washington and cut hundreds of millions of dollars in humanitarian and development aid for Palestinians. Lara Friedman, a former U.S. foreign service officer in Jerusalem and president of the Foundation for Middle East Peace, called the consulate closure "a massive shift" in U.S. policy. "At this point we are saying to the Palestinians and the world — we do not see the Palestinians as a people to engage directly. They are now a minority and a subset to our relationship with Israel," said Friedman, who is not related to the ambassador. "Given the ideological leanings of Ambassador Friedman, it seems to me that ... you have a big filter on reporting that's taking place," said former Consul General Abington. Israel's Foreign Ministry declined to comment on the consulate closure. But Zalman Shoval, a former Israeli ambassador to the U.S., called it positive. "I would have no objections for the U.S. to have a consulate in Ramallah, for instance, for the Palestinians," Shoval said, referring to the West Bank city where the Palestinian Authority is headquartered. "But to have a separate consulate in another part of Jerusalem creates a certain fact of splitting Jerusalem into two parts, something which Israel is opposed to." Scott Lasensky, former adviser to the U.S. ambassador to Israel under the Obama administration, said there were "gross inefficiencies and convoluted lines of authority" with the consulate general and embassy working separately. But he added that the merger "will be widely perceived as a dismantling of previous U.S. policies that positioned Washington as the lead peace broker and advocate for a two-state solution." The consulate closure is subject to a congressional review period, according to U.S. officials, but it is unclear if any Congress members registered any formal objections to the mission merger. House Foreign Affairs Committee staffers did not return NPR's requests for comment. Democratic Sen. Patrick Leahy's office said he objected to the move, but his office was not aware of any congressional review process. "It downgrades our diplomatic posture with the Palestinians at a time when the Trump administration is cutting aid and tightening the screws on the Palestinians, and restricting our engagement with them, apparently believing they can be pressured into supporting the White House's yet to be revealed Middle East peace plan. To the contrary, it has only increased the Palestinians' desperation and distrust, widened the gap between us and them, further damaged our credibility as a mediator, and made the prospects for peace more elusive," Leahy's office said in a statement to NPR. "The administration seems to view Israel-Palestine as more or less one and the same," Miller said, "and that they're thinking not of a two-state solution but something along the lines of a Palestinian state-minus."